On 8.5" x 11" SHEET OF 15 LABELS - Pack of 25 Sheets. 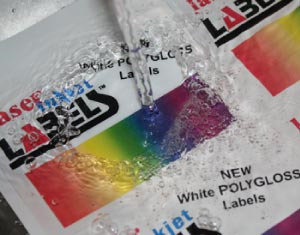 Now You Can Print Water-Resistant Labels on YOUR OWN Inkjet Printer. Have you ever needed 50 custom printed labels for your product only to find out that the minimum order is 10 times that amount... and hundreds of dollars above your budget? 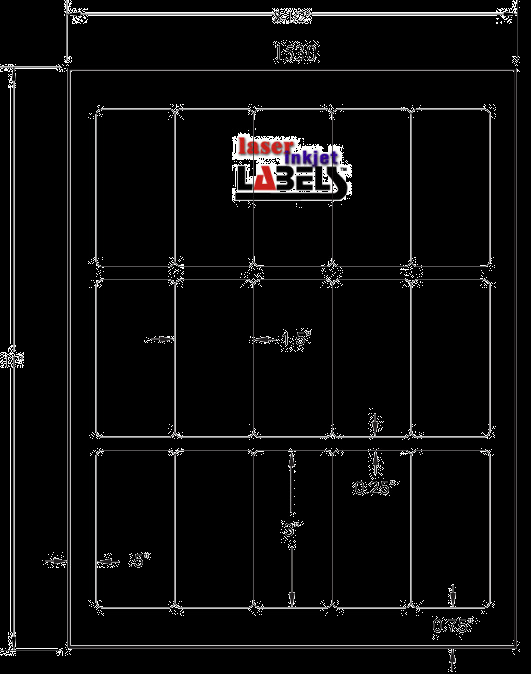 Then you need our White Poly Gloss Inkjet Printable BOPP Labels. The incredible new technology used on these labels allows you to print 1 to 1000's of water-resistant labels, as you need them! White Poly gloss labels are made using a 2 mil white BOPP sheet. The adhesive is an aggressive general purpose - all temperature permanent water-based acrylic. The face has a super shiny gloss finish. When used with pigment based inks, our unique top-coating locks inks in. For best results we recommend printers that use a Pigment based ink cartridge. Check out our Pigment Based Inkjet Cartridge chart to see if you have the right inks. If you haven't seen the video of the product going directly from the printer to the faucet, check it out here: Inkjet Waterproof Video. Stop wasting and paying too much for expensive custom printed labels you don't need and order our Poly gloss inkjet labels below! Attention: To keep costs as low as possible, we request that you sample this material to determine that the stock will work as expected for your application. To get your free sample, please go to our Contact Us page.